No Spring Water - No Vote! 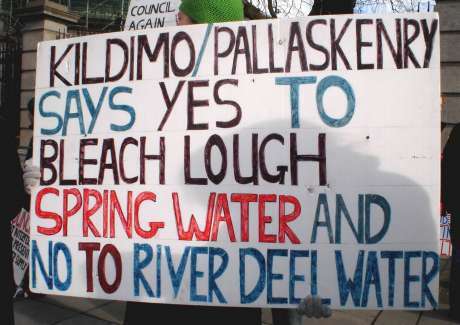 Setting up a picket line to stop the pipes being laid, the Kildimo/Pallaskenry Bleach Lough retention committee say that they would rather be locked up behind bars than be forced to drink water from a river that is "floating with dead animal carcasses, human excrement, fish kills and rubbish”. According to the vice chairperson and secretary of the group, Dan Foley, they have enjoyed clean pure water from the nearby Bleach Lough spring source for the past 50 years. 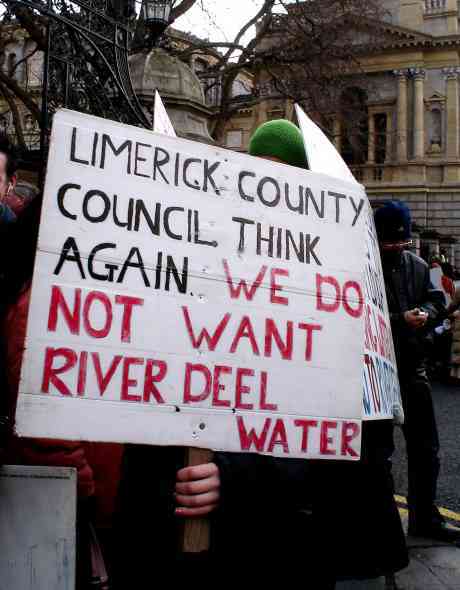 And he said that they shouldn’t all be forced to take water from "one of the most polluted rivers in Ireland” when there is ample capacity at the Lough to cater for everyone. The controversial pipeline is due to reach the white picket line within the next two to three weeks. But Mr Foley said that they will be there to meet it when it comes. 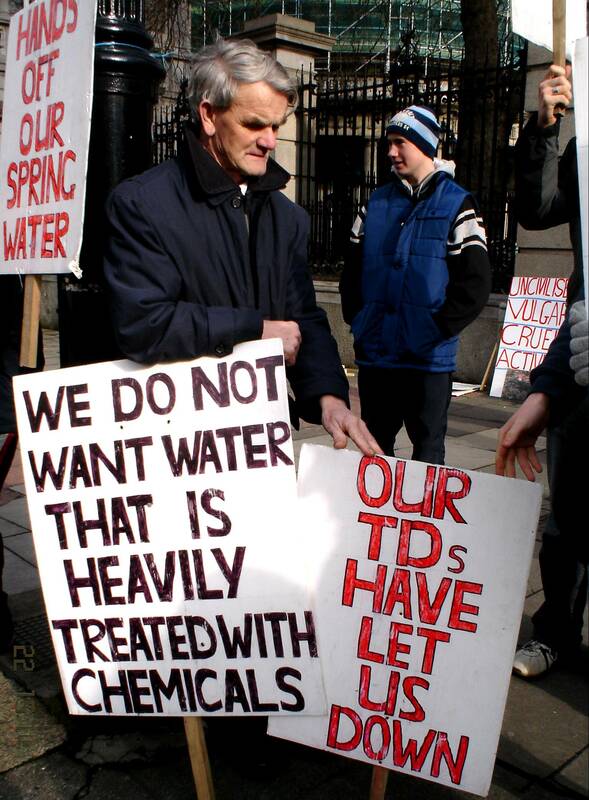 This issue was discussed as far back as 1991 in the Seanad and still it seems that the Department of the Environment are "planning for pollution rather than introducing effective measures to ensure that such pollution does not take place." Environmental Protection Agency Bill, 1990: Second Stage (Resumed). "The Department of the Environment are a bit negative in this in that they were heretofore accepting a situation that the environment will deteriorate. For example, the Department, rather than ensuring that our waterways remain clean, are now adjusting policies to cater for future pollution of our lakes and rivers. This is a wrong attitude in the Department's approach. A town in my own area, Pallaskenry, County Limerick, has enjoyed fresh water for over 20 or 30 years. 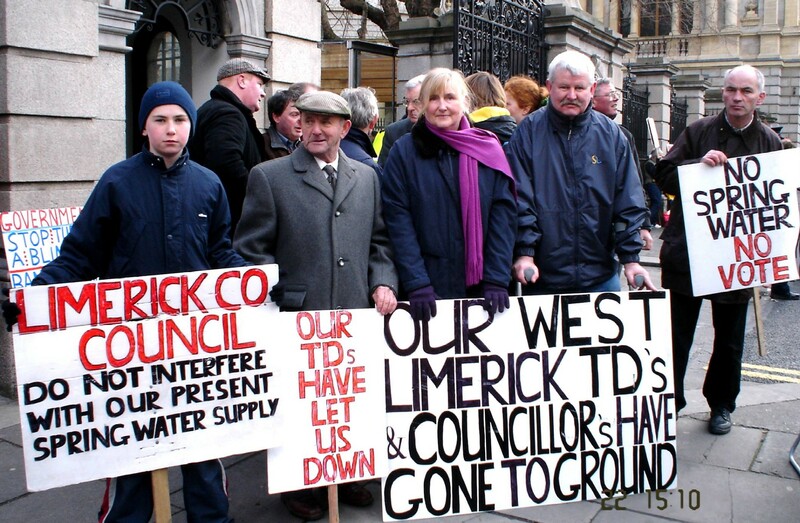 When there was a proposal to  extend the scheme the local authority advised that the Department will not accept the present source — a spring fresh water lake source — because of the future danger of pollution. The people have been quite happy over the last 20 years and for many thousands of years this source has remained unpolluted. Now the Department say it is their view that there is a danger of pollution. They will not accept the present source and insist that the new source shall be from the river Deale. 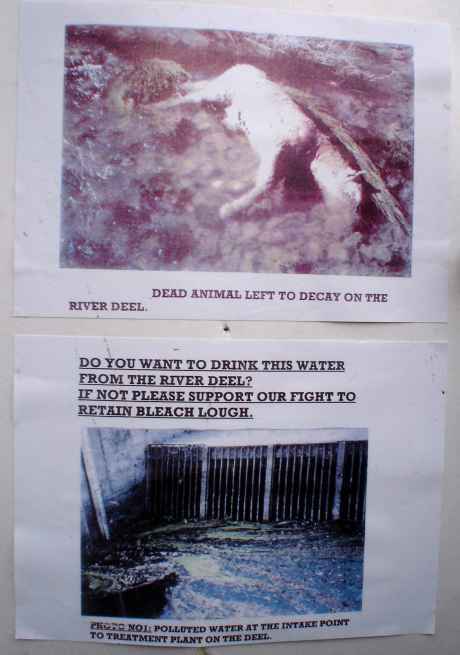 While I accept the treatment this water will get through the environmental section of Limerick County Council, I think it is a sign of the Department of the Environment's attitude that they are now planning for pollution rather than introducing effective measures to ensure that such pollution does not take place. The Department should have confidence in the preservation of the present source and that we will have an improvement rather than a disimprovement in the environment. If they are not confident that that would be the case they should introduce protective measures to ensure that it is the case. I hope that the Bill and the new Agency will change the Department's attitude towards this. No doubt we do need a watch dog to protect the environment and we need a body to co-ordinate environmental protection. " 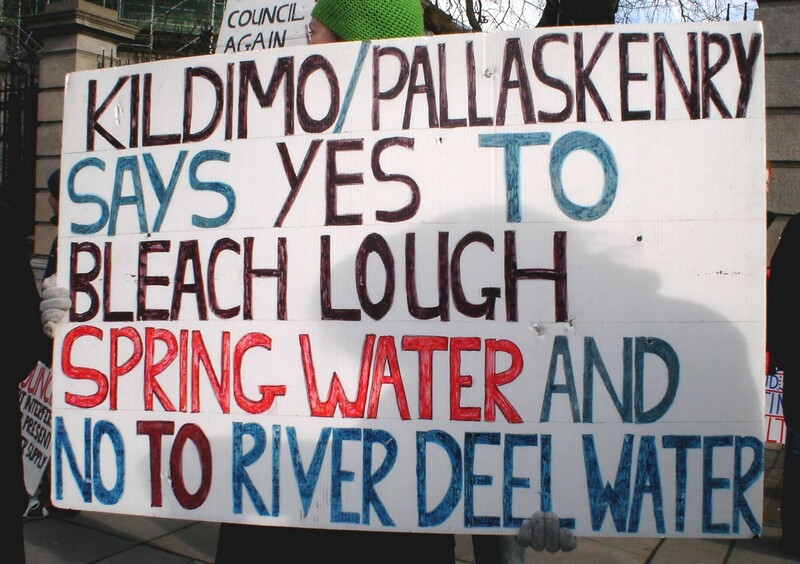 Pallsekenry and Kildimo residents wake up the river Deel water is on its way to you. If Limerick county Council have their way young mothers will be in jail and you will be drinking river water that is treated with maximum chemicals. Get up and get out to the White line to support your neighbours. 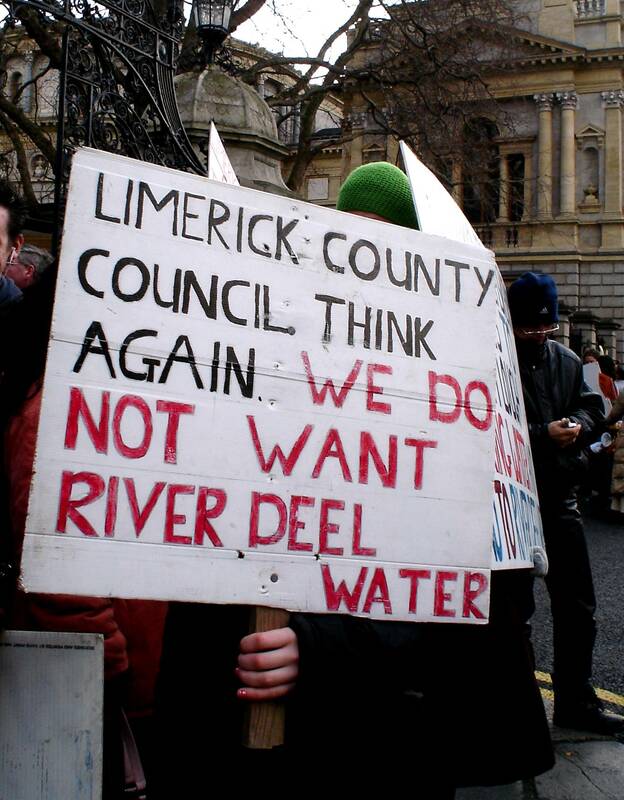 It will be to late when the Deel water is in your taps.